I was asked to do a special article examining the overall WWE Superstar Shake-Up and so, here it is. 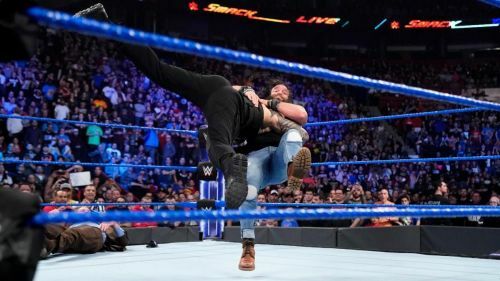 In this feature, I shall try and determine whether the calls that WWE took on RAW and SmackDown Live were effective from a long term perspective. Obviously, there is absolutely no way to predict the future, until it actually plays out. I mean how many of us would have assumed that Elias, Alexa Bliss, and Carmella, three individuals who hardly made an impression in NXT would be such major players in the WWE main roster? Who would have assumed that Asuka would not fare nearly as well as she did back in NXT? But based on guesswork and fantasy booking, let me try and determine whether the decisions WWE took during the Superstar Shake-Up will be effective or not over the long run. Because the brand you are on could be a make or break factor for almost everyone in the WWE Roster. Yes, the Sky Pirates were great, but Asuka pairing up with Kairi Sane isn't the worst idea since it gives Io Shirai a solo run in NXT. Well, Paige had promised us that she would be bringing a team to SmackDown Live, and she did! I think that the pairing of Asuka and Kairi Sane is great because both of them are incredible in the ring. And this pairing makes the Women's Tag Team title picture exciting again. Otherwise, one hears crickets chirping during their segments. Obviously, English is not the first language for either of the women and Paige can help overcome that shortcoming. It also keeps Paige on TV and we all know how much she loves being on screen. It's a win-win situation for everyone involved. I think that this pairing will hold some gold very soon. I do not foresee the IIconics holding the titles for a long duration.